Tangential ogive All of the ogives that I make at the moment are tangential ogives, meaning the ogive is tangent to the front band (or bore riding band, as the case may be). Because it is tangent, you cannot tell just by looking where the bands stops and the ogive begins. There is only one radius that will produce a tangential ogive for a given metplat, band diameter, and nose length, so once you have defined these parameters, the online design program determines this radius and displays it (in inches) near the bottom of the page. Advantages of the tangential ogive The very gradual start of the tangential ogive may help to guide the bullet into the rifling. It also adds to the bullet's bearing length. The nose carries more weight than other nose designs, so the base of the bullet can be shorter for a given weight. Disadvantages of the tangential ogive On light-for-caliber bullets, a blunt tangential ogive may result in a nose-heavy bullet that has an undesireably short base. On ogival flat point revolver bullets, the "fat" part of the ogive may cause difficult chambering if the bullet is sized to throat diameter, as it should be. Secant ogive The radius of my secant ogive is, by definition, twice the radius of the tangential ogive, all other specs being equal. In general, a secant ogive is defined as any radius larger than a tangential radius, but I happened to pick twice the tangential's radius because that was a simple way to program it. 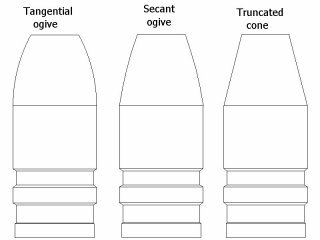 An example of a secant radius is the Hornady spire point jacketed rifle bullets. The secant improves the ballistic coefficient a teeny bit compared to a tangential ogive. It also reduces the bearing length. Advantages of a secant ogive The secant ogive allows chambering in shorter throats, compared to a tangential ogive. For that reason, a secant ogive is sometimes chosen for Freedom Arms revolvers and for some leverguns. Truncated cone The truncated cone nose is a little lighter than the equivalent tangential ogive. That may be an advantage for light bullets and a disadvantage for heavy bullets. Unlike an ogival bullet, the cone does little to guide the bullet into the rifling. Choosing a radius You can't specify the radius but you can manipulate it, especially with bore riding bullets, by tinkering with the bore riding length, metplat, and nose length.